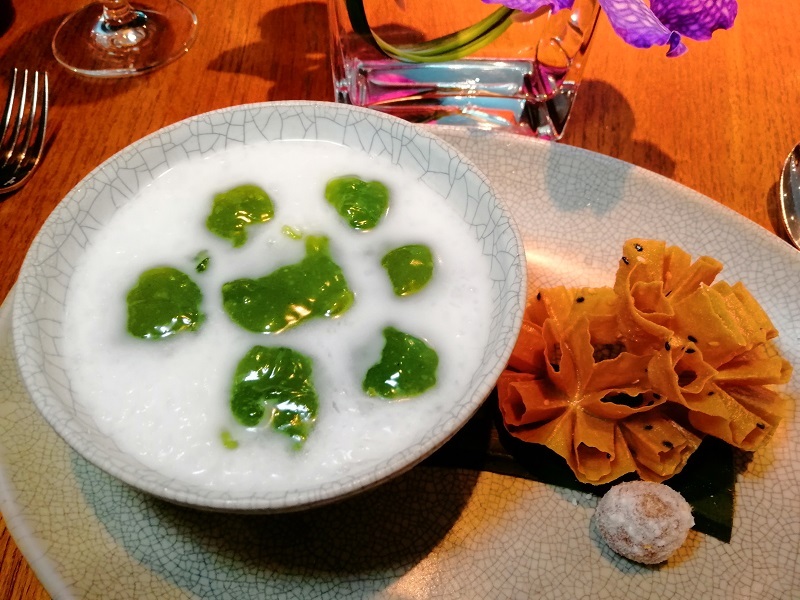 Nahm is rated as the 10th best restaurant in Asia and #49 in The World’s 50 Best Restaurants by the well regarded S.Pellegrino list. They also have a Michelin star in the Bangkok Michelin Guide. 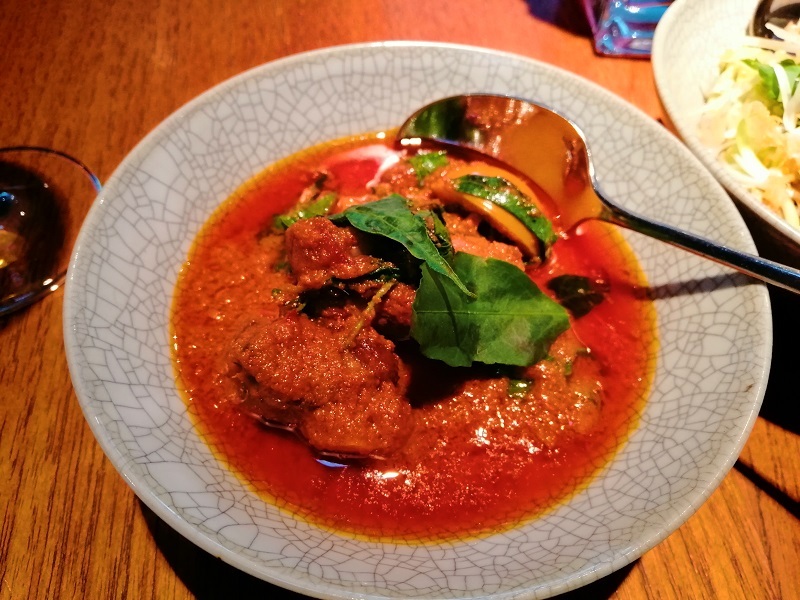 I was quite excited to try this restaurant as the owner is an Australian (Chef David Thompson) whose Nahm London was the first Thai restaurant to get a Michelin star. 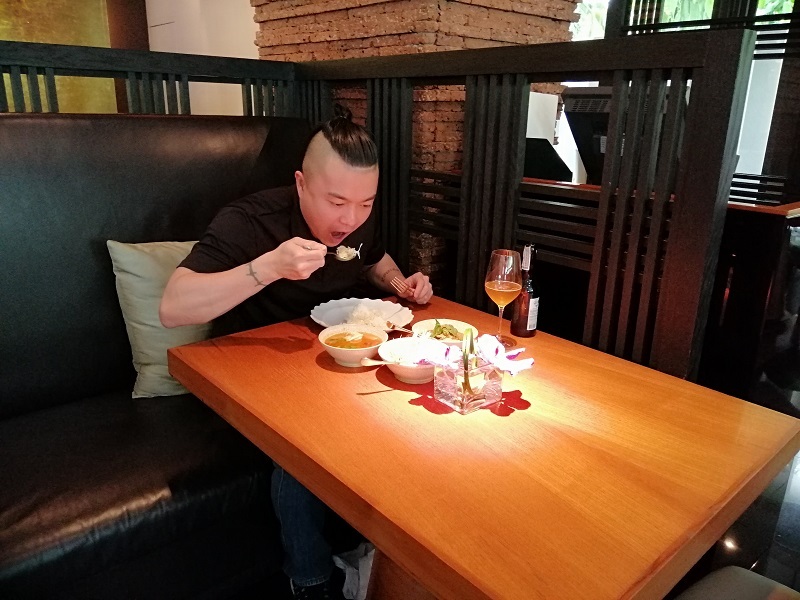 It’s unusual for an Aussie to be regarded as a trailblazer for Thai food in Thailand so the kudos doesn’t come with some amount of controversy. 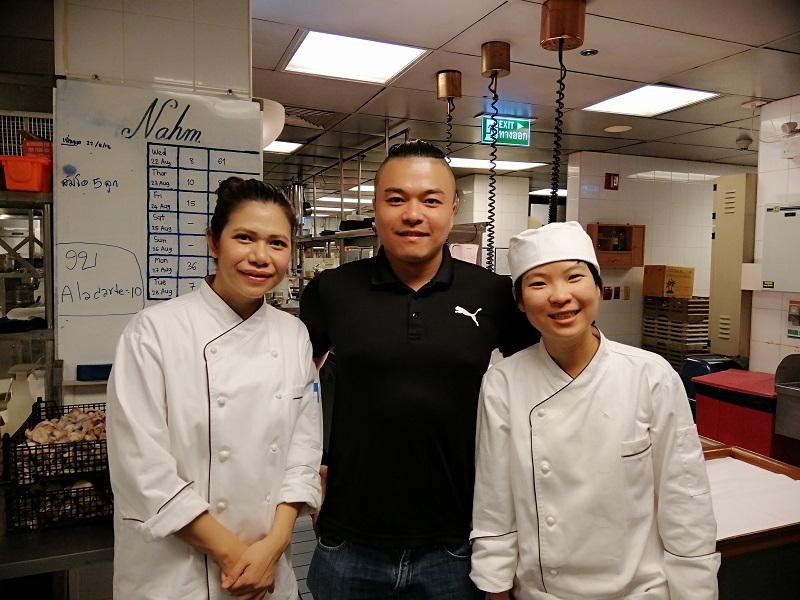 However, he has since stepped down and given over the reins to Chef Pim Techamuanvivit (who owns the 1 Michelin Star Kin Khao in San Francisco). I must admit, I’m not an expert in Thai cuisine and I don’t know enough about flavor combinations and classic spices to comment on that. I just know what tastes good to me. 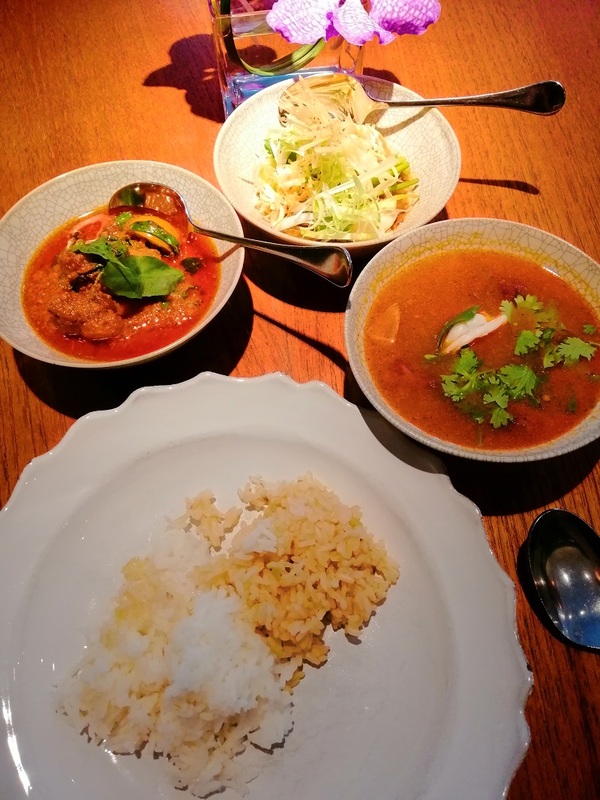 I’m hitting up several Thai restaurants with a Michelin star this trip (Nahm, Sanah Jaan, Bolan and Sra Bua) so I can compare between them. I thought my Bangkok Michelin star collecting trip should include an appropriately large sample of Thai food restaurants. 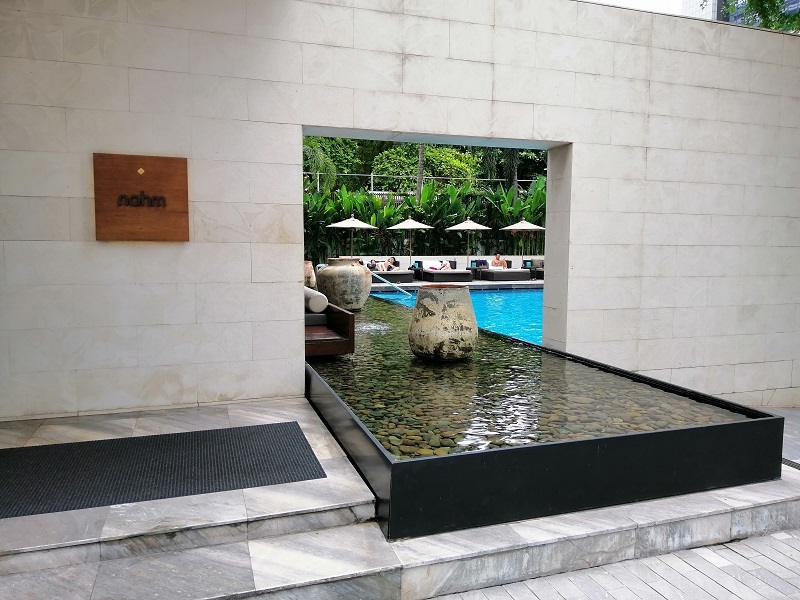 Nahm is located at COMO Metropolitan Bangkok, which is a nice hotel in a swanky neighborhood. There’s a private school just up the road. 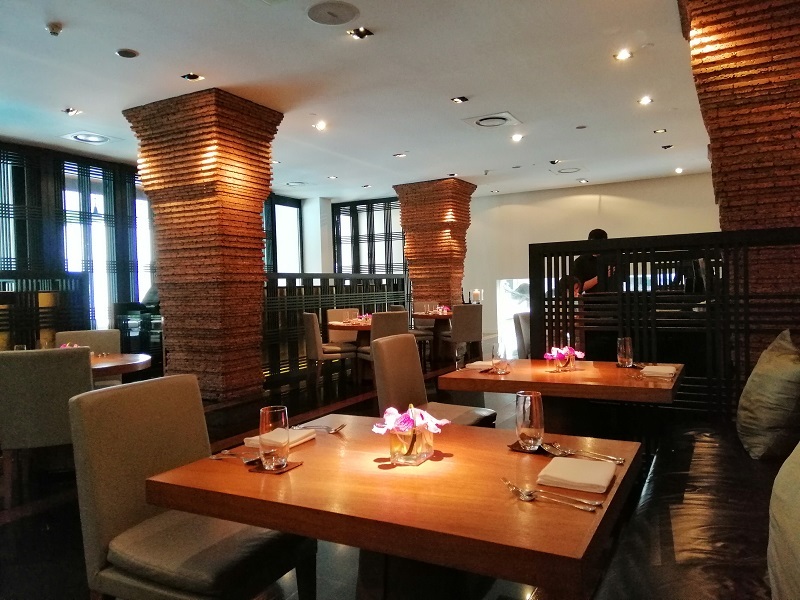 You can see the pool from the restaurant and the interior of Nahm is decorated elegantly. There’s soothing Thai instrumentals playing softly over the speakers and the lighting is subdued, but with powerful directed lights illuminating the tables so you can see your food when it comes. The service was excellent too. I had a very attentive (in a good way) waiter that anticipated my needs and wants. From our conversation, he found out that I’m a food geek and offered me a tour of the kitchen by the chefs, which I enjoyed very much. I like how some service staff is astute enough to know what you like and provide that proactively without asking. It’s a sign of great service. 10/10. 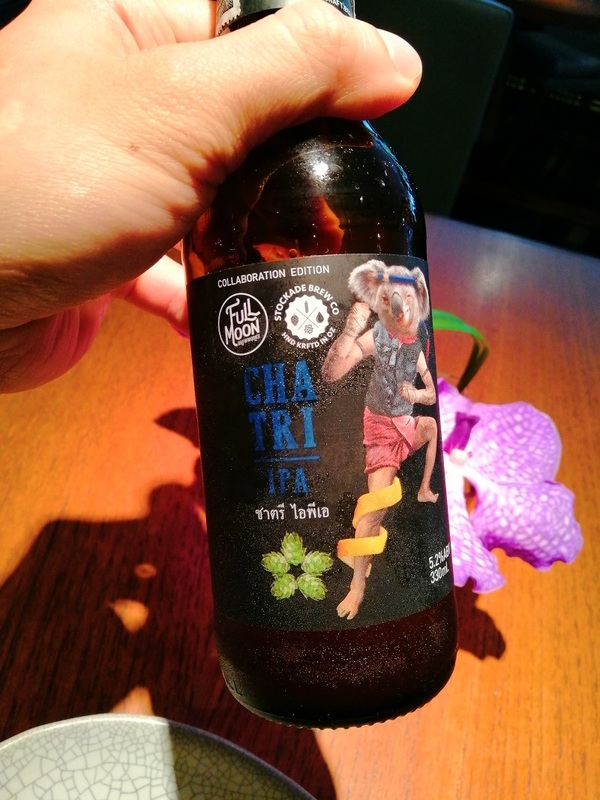 I ordered a Chatri IPA (360 baht). It’s a collaboration edition between Full Moon Brewworks in Phuket and Stockade Brew Co in Australia. It’s a very hoppy beer, pleasantly bitter and grassy tasting. It goes very well with strong tasting Thai food. The first bite was a savory crepe made with prawns. It’s crispy and sweet-savory. It tastes very shrimpy and goes well with the sweet toasted coconut topping. I went for the lunch set menu for 1,600 baht. You get both canapes, a choice of one each from the entrée, soup, curry and wok fried, steamed and grilled sections as well as a dessert. 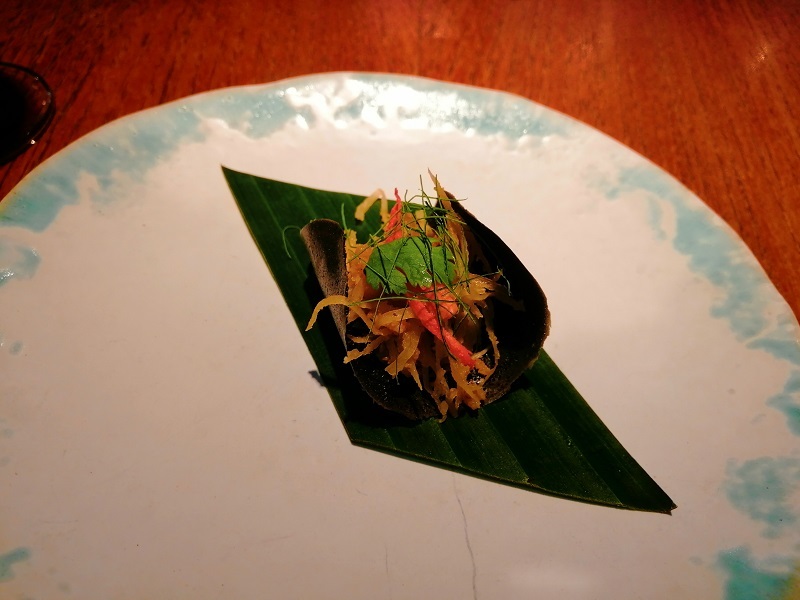 The canapes was Bright santol dressed with dried shrimp, pork, peanuts and herbs served on crisp rice crackers (470 baht) and Miang of lobster, chicken, green mango, snake fruit and herbs served on thong-lang leaves (500 baht). Santol is a tropical fruit that is shaped like a mangosteen but orange in color. The server recommended eating the santol one first since betel leaf is quite intense tasting. 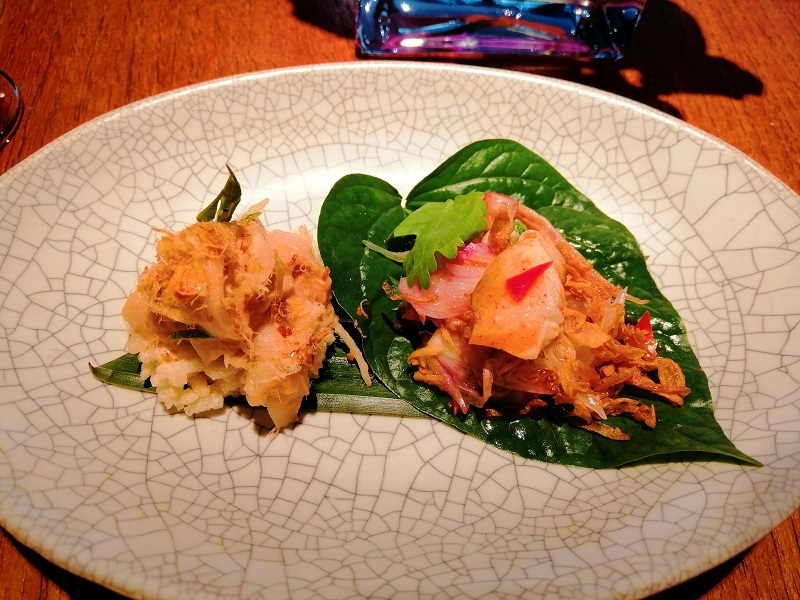 I liked it but I prefer the miang kham interpretation. I love the addition of snake fruit (what we call salak in Sarawak) in the betel leaf (actually Indian coral tree leaf, the other leaf they use for this). It’s very flavorful, complex and appetizing, three characteristics you want people to describe your entrée. 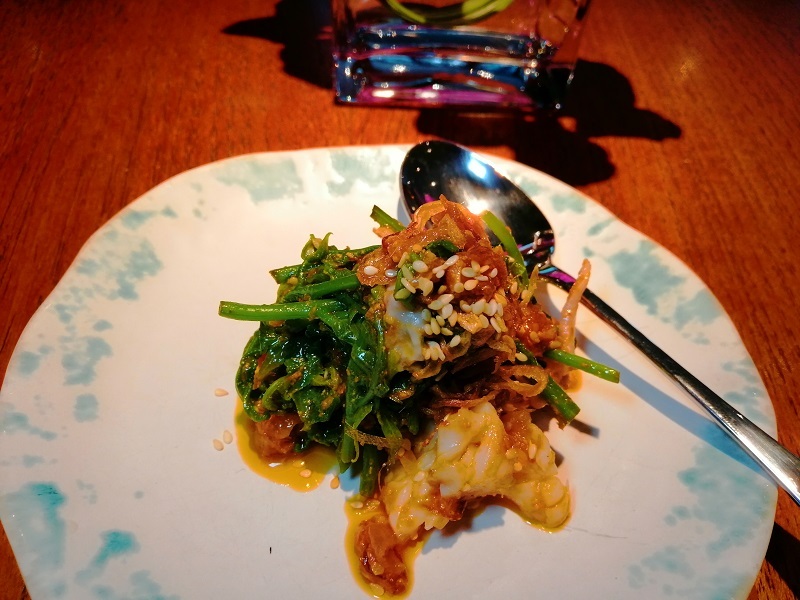 I chose the Fiddlehead ferns from Northern Thailand with songkla wild prawns and delicious tawai dressing (780 baht) as my entrée. The fiddlehead ferns were perfectly cooked, as was the accompanying juicy shrimp. The prawns added the taste of the sea into the dish and the coconut and chilli notes rounded things up. It’s excellent but a bit difficult to eat with the provided spoon. A fork would have been better. The main dishes all came together next. I’ll go through them one by one. You’re supposed to eat the dishes together with rice, of which two varieties were served. There’s a Thai red rice option that tasted surprisingly good and a white fluffy variant I preferred (Suphanburi young harvest rice). These were topped off promptly too, the waiter will come with the two mounds of steaming rice on banana leaves when he sees you’re about to finish yours. I liked the Tom yum soup of river prawn, blue foot mushrooms, chilli jam (450 baht) with a single large prawn. This was my choice of soup. The spiciness level is quite intense even for me, and I eat Thai bird eye chillis raw by the bunches. It’s very good though. It’s so sour and flavorful! The soup really whets my appetite. Rich red curry of duck with snake fruit, sour yellow eggplant and chilli leaves (770 baht) was decent. Don’t get me wrong, there’s nothing bad about it. It just had the misfortune of coming out with the stellar fish, which overshadowed it. It’s decent and spicy, just a bit too oily for my tastes. Not my favorite thing. The fish was the real star. 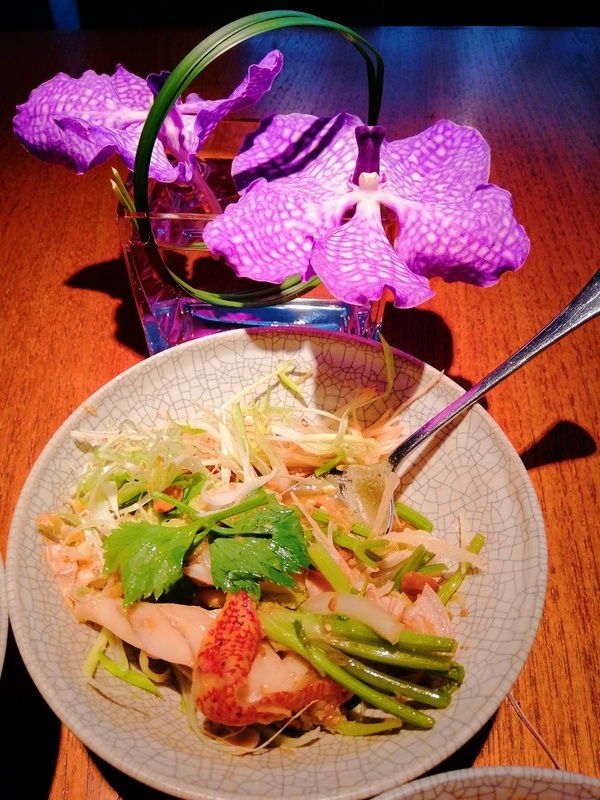 I went for the Steamed leopard coral grouper with pork, fermented yellow beans and fried garlic (880 baht). 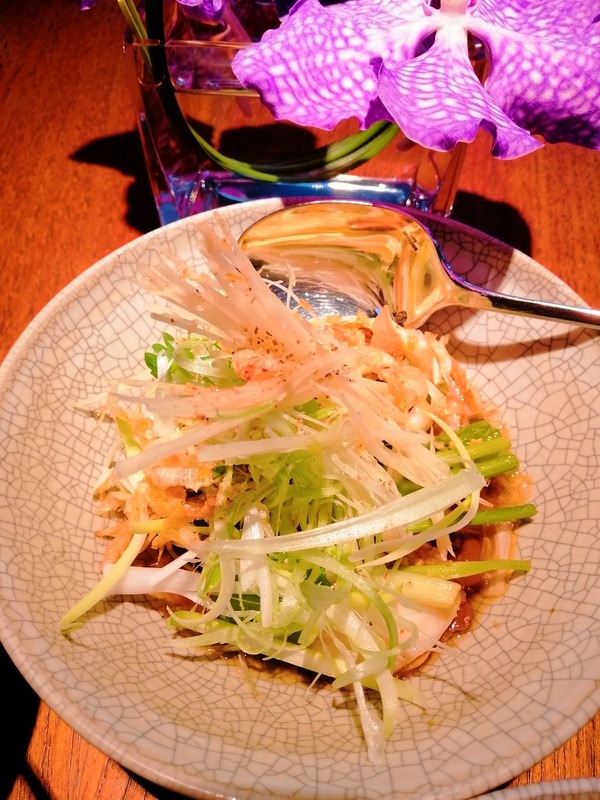 It’s red coral steamed perfectly with aromatics. So delicious, I wanted more. There’s a lot going on here, both flavorwise and in the texture department. I saw whole taucu bean split in half and there’s some crunchy elements in the dish too. 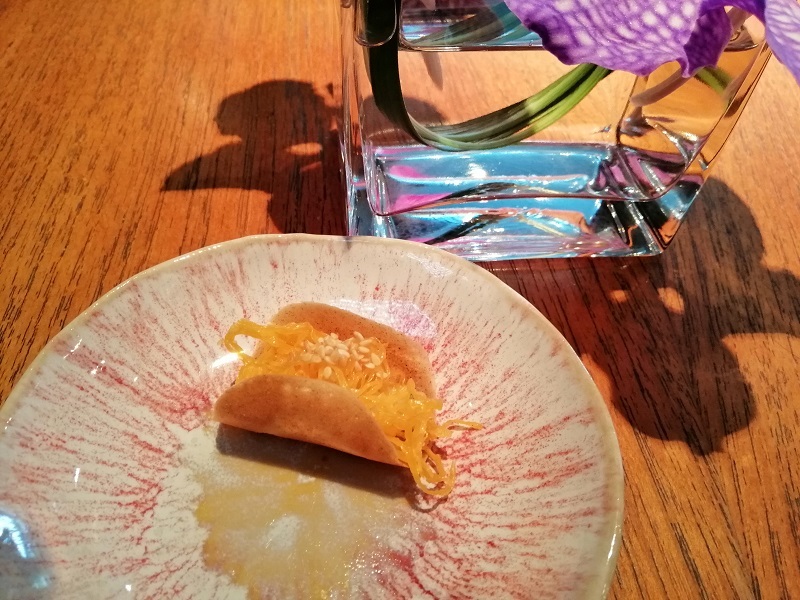 Dessert is a sesame crepe and a local Thai sweet with a dish described simply as Pandanus dumplings in fragrant coconut milk (350 baht). I spooned one mouthful and was so pleased I exclaimed “Mmmm…” out loud! I thought it was bubur cha cha or something similar. I expected it to be hot. It’s not. It’s icy cold with shards of tiny ice. The strong and intense jasmine taste is spectacular. You can smell it before you eat it and the jasmine permeates all your taste buds and sense of smell. So awesome! They make it with jasmine scented water. The pandan dumplings are delicious too. They’re not sweet, almost neutral and slightly bitter. It’s perfect paired with the mildly sweet jasmine water. It was so good I ordered another serving a la carte. No joke. The a la carte one came with more dumplings and an additional crepe. My waiter sheepishly told me that the set menu only has 1 crepe and less dumplings but the a la carte has more. This dessert also tastes better when you break the crepe into the dish for a crunchy texture. Such a strong finish! I was given a tour of the kitchen courtesy of my waiter. He introduced me to Head Chef Jan, who delegated another younger chef to bring me around the kitchen. Nahm has a huge kitchen, with a finishing/plating area featuring the same lamps that are in the dining room, presumably so they can see how it actually looks like outside. There’s a dry area, a wet area and a special kitchen for pastries/desserts. 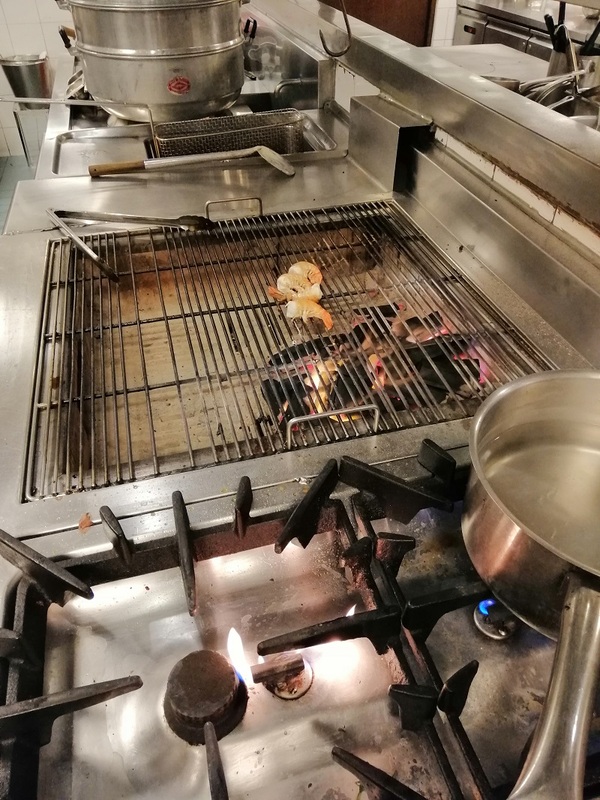 There’s even a charcoal grill inside where they can grill prawns for that authentic smoky flavor! I also went to the kitchen they share with the rest of the COMO Hotel F&B outlets. I hear this is where they prepare room service. The ending bite is a small bite they give you when you ask for the bill. It’s the polar opposite to the first bite, the yin to that yang. This cracker is sweet instead of savory but the filling is the same toasted coconut. I thought that gave the meal a nice and symmetrical cap. 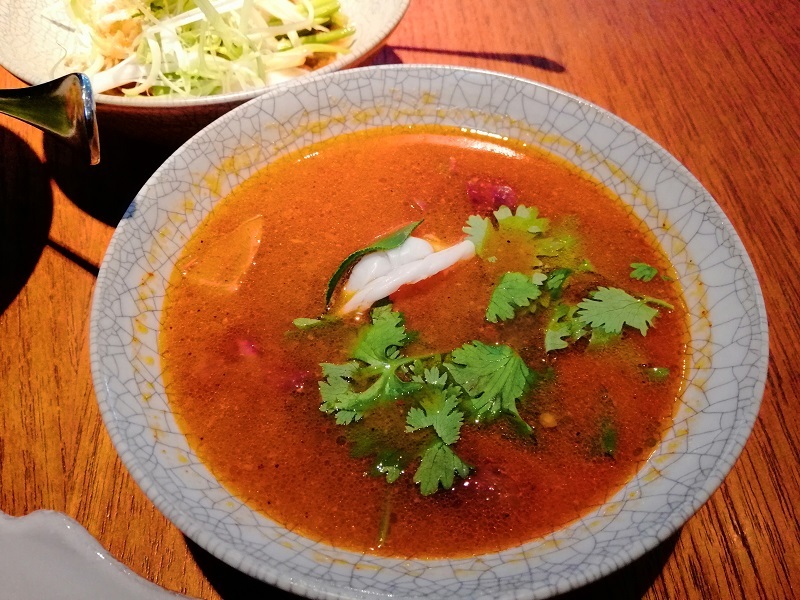 I highly recommend Nahm for Thai food. 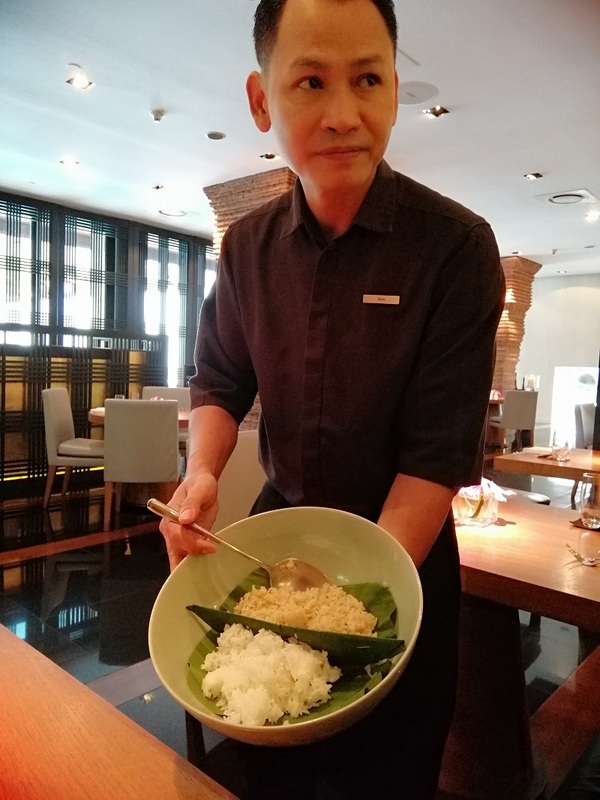 Their lunch is a great deal at 1,600 baht. I went with a beer (360 baht) and an additional pandanus jasmine dessert (350 baht) so my bill was 2,718 baht (RM 343). Lovely ambiance, excellent service, great food. I couldn’t ask for more. Recommended!